Many years ago, because skordalia is traditionally made with raw garlic (recipe for traditional version here), my father had to make some adjustments to this dish before our young and Americanized palates would tolerate it. By simply substituting roasted garlic for raw, he retained much of the healthy goodness and original ingredients but with a much more subtle garlic flavor. We’re all addicted to it and I think you will be too! 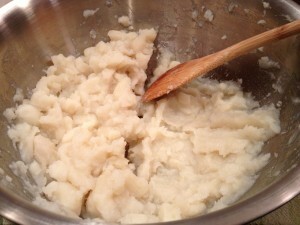 I like to use russet or red potatoes as they are softer and fluffier. Try to stay away from waxier potato varieties as they can bring an almost a wallpaper paste consistency to the dish. You may choose to have a chunkier, more smashed-potato texture to your skordalia. 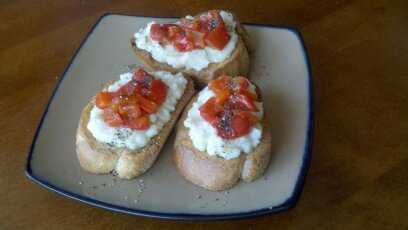 I happen to prefer a bit smoother, creamier, more spreadable consistency myself. Try it both ways and see which is your favorite. You can always substitute some raw garlic to add a little more bite. It may be more to your taste than the milder roasted flavor. There are definitely days when I’m in the mood to add a couple of raw cloves. Either way, it’s a great recipe to experiment with and change up to suit your preference. Because my mom’s family is from an area of Greece where lemon trees are everywhere, skordalia recipes there use lemon juice instead of vinegar. In this recipe especially, I think the lemon juice really perks up the flavor but feel free to substitute with vinegar for a bit stronger taste. Skordalia is served at room temperature and refrigerated, it will keep for 7-10 days, though it rarely sticks around that long! As I mentioned earlier, the versatility of this dish will make it a go-to in your vegan cooking repertoire. You can spread skordalia on toasted bread rounds, add toppings like roasted red peppers and olive oil or pair with a dish of olives and a piece of crusty bread. 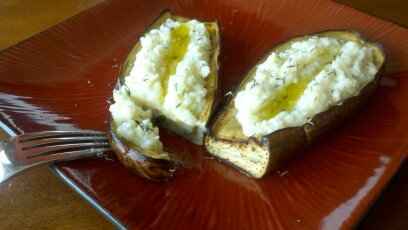 For a meal, top a roasted eggplant with skordalia, pair with a glass of white wine and dinner is served. 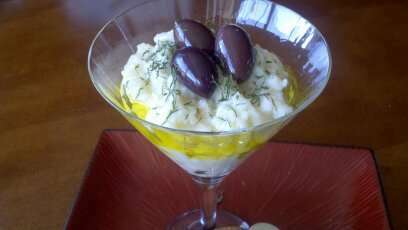 For a fun twist when entertaining, fill a martini glass and garnish with EVOO, a few olives and dill for a first course that will be a big hit with your vegan and non-vegan guests alike. Peel and cube potatoes and boil until they are easily pierced with a fork (about 15 min). SAVE 1 cup of potato water and set aside. Mash roasted garlic cloves in a mortar and pestle. 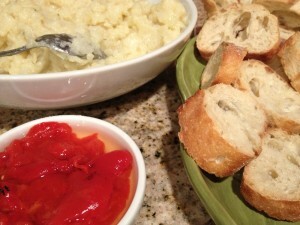 Add garlic mash to large bowl with boiled/cubed potatoes. Mix well using the back of a large wooden spoon or immersion stick blender. Add EVOO, lemon juice and potato water a little at a time, continuing to mix well. Add salt and pepper. Taste and adjust seasoning if needed. Depending on desired consistency, add additional reserved potato water. This recipe makes 5 cups of skordalia. 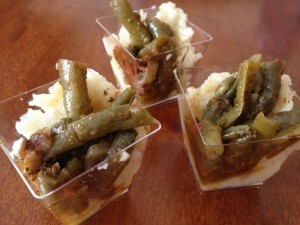 I brought these party size skordalia with Greek green beans to a holiday pot luck and they were a big hit. The flavors of the potatoes, beans and garlic were delicious together and the green and white color combination was festive too! We used to run a Greek restaurant in the 70’s in trendy Bayswater. My partners mother made all these homey Greek dishes.. I just made it with what I had.. sweet potato and cauliflower and one potato. 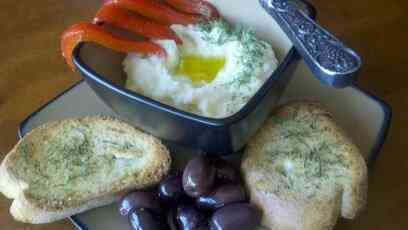 Loved the roast garlic idea, chopping off the top. Great.. thanks.. eating it with roasted romano sweet pepper and extra fine green beans.. and a spoonful of my lacto fermented veg.. as a condiment.